Collar Counties - FITZGERALD LAW GROUP, P.C. Originally part of Cook County, DuPage County has transformed itself from a primarily agricultural economy to one rich in many different types of commerce. Today, DuPage County’s per capita income is the highest in the Midwest. Nineteen of the county’s towns have average household incomes of over $100,000. 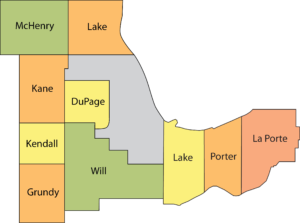 DuPage County is the second most populous county in Illinois. The county is divided into nine different townships: Addison, Bloomingdale, Downers Grove, Lisle, Milton, Naperville, Wayne, Winfield and York. Grundy County was established in1841. Largely agricultural, as of the U. S. Census of 2010, there were 41,535 people residing in the county. Kane County was established in 1836. According to the 2010 census, it has a population of 515,269, which is an increase of 27.5% from 404,119 in 2000. Its county seat is Geneva, and its largest city is Aurora. Kendall County is a county located about 40 miles southwest of Chicago. It was established in 1841. According to the 2010 census, it has a population of 114,736, which is an increase of 110% from 54,544 in 2000. It was the fastest-growing county in the United States between the years 2000 and 2010. It’s county seat is Yorkville. Lake County is locatedin the northeastern corner of the state on the shore of Lake Michigan. According to the 2010 census, it has a population of 703,462, which is an increase of 9.2% from 644,356 in 2000. Its county seat is Waukegan. McHenry County is located about 40 miles northwest of Chicago. According to the 2010 census, it has a population of 308,760, which is an increase of 18.7% from 260,077 in 2000. Its county seat is Woodstock. Long known as a center of agriculture and recreation, it has more recently experienced rapid rates of suburbanization and urbanization. Will County is located 28 miles southwest of Chicago. According to the 2010 census, it has a population of 677,560, which is an increase of 34.9% from 502,266 in 2000, making it one of the fastest growing counties in the United States. The county seat of Will County is Joliet. Lake County is a county located in the U.S. state of Indiana. In 2010, its population was 496,314, making it Indiana’s second-most populous county. The county seat is Crown Point. The county contains a mix of urban, suburban, and rural areas. LaPorte County is located in the state of Indiana. As of 2010, the population was 111,467. The county seat is the city of LaPorte. Porter County is located in the state of Indiana. As of 2010, the population was 164,343. The county seat is Valparaiso. Porter County is the site of the Indiana Dunes, an area of ecological significance.